Speaking of Disney, the premier thing strikes you possibly is its animations, like the warmly received Frozen, Monsters University, Toy Story and more. Unexpectedly, this time, instead of a cute animation, Disney Studios distributes a more visually intriguing body of work-Need for Speed, which is an American action film directed by Scott Waugh and adapted from the most successful video games series. Plot Summary: The hero of this film called Tobey Marshall, just fresh from prison, is a street racer who was framed by a wealthy business associate and now joins a cross country race to settle the score with the man responsible for his false conviction. Since its release on March 14, 2014, the movie has earned $17,844,939 in North America, and $45,600,000 in other countries as of March 17, for a worldwide total of $63,444,939. It's self-evident that how popular it is. So, not surprisingly, the online DVD selling stores are going ahead at full steam. 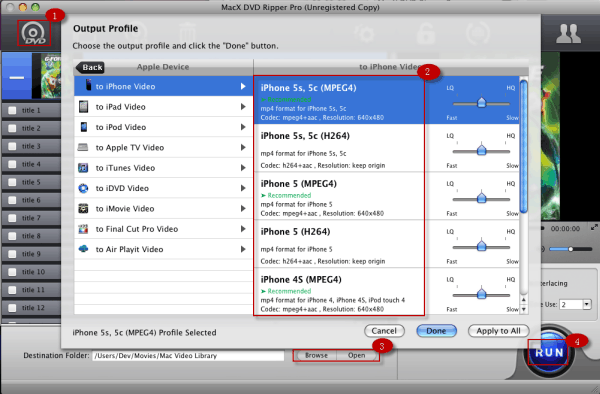 · Rip DVD movies to iPhone iPad Android MP4 etc. In case you have bought the DVD from Amazon and still play it with DVD players or drivers, fine, it's okay. But the DVD from Amazon has a region code "2", which means it may not be viewable outside Europe. Meanwhile, it seems somewhat out of fashion. You know, as portable devices like iPhone, iPad are in possession of stylish appearance, easy-to-carry character and complete entertainment functions, playback DVD on them while going around becomes the most fashionable way of watching DVD movies among DVD lovers. Certainly, supposing you feel like watching DVD movies on your smart phone or tablet, you may have to prepare a solid yet comprehensive DVD ripper that can remove DVD region code. Here a world-renowned DVD ripper - MacX DVD Ripper Pro is highly recommended to you, which will aid you to rip and copy DVD to MOV, MP4, AVI, FLV, MKV and almost all the video formats without DVD read error. so that you can play the movie on your iPhone, iPad, HTC 10, Samsung Galaxy S9 anytime anywhere. If you question its ability of parrying Disney protection tech, you just meet trouble halfway. MacX DVD Ripper Pro cuts the buck in decrypting Disney protection and ripping any Disney DVD effortlessly. This DVD ripper disabled the Disney copy protection measure like a cork, selected the right movie title right after it opened the DVD and managed to rip DVD Need for Speed to MP4 within half an hour while maintaining zero loss high quality. This top-ranking DVD ripper for Mac is capable to not only rip and copy Disney Need for Speed DVD, but also clutch other encryption updates like copying DVD encrypted by CSS, Region Code, Sony ARccOS, UOPs, etc. Put it another word, you can copy and rip all Disney encrypted DVDs using the best Disney DVD ripper, no matter the classic Disney DVDs like A Christmas Carol, Toy Story, The Lion King or the newly released DVDs published, such as Frozen, Zootopia, The BFG, The Jungle Book, Finding Dory and a lot more. Download MacX DVD Ripper Pro, install and launch it. Click "DVD" to load the DVD which you want to rip. Tips: the software can automatically detect the correct title from the 99-title Disney DVD to ensure the main movie content to be ripped. The Disney DVD ripper for Mac supports to copy DVD with original video quality and original 5.1 channels Dolby AC3/DTS audio, back up Disney DVD to MKV, or back up DVD to MPEG2 with main/full title. Click "RUN" button to start Disney DVD Need for Speed copying on macOS. Just after a few minutes, you can import Disney DVD to the device you want to watch on.